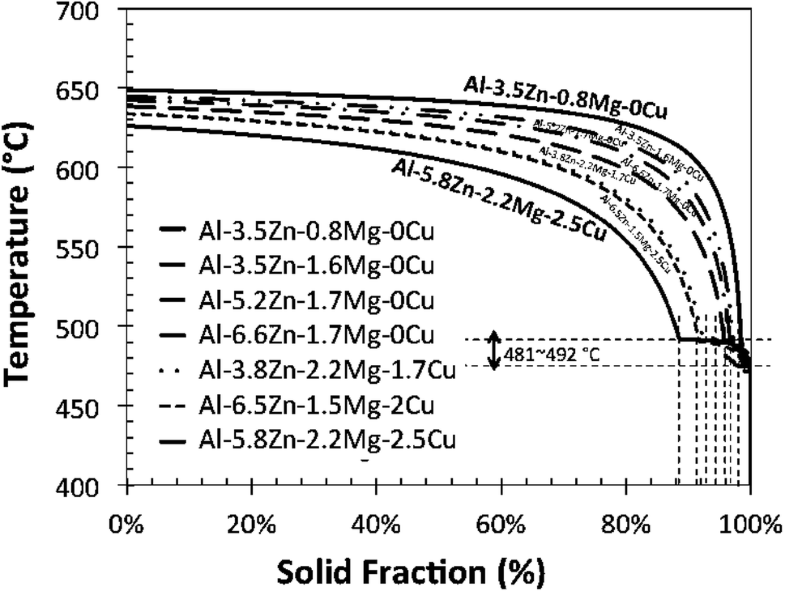 In this study, the effect of alloy composition on uniaxial tensile properties of Al–Zn–Mg–Cu alloys was investigated using seven distinctive alloy compositions. The sample alloys were manufactured as net-shaped components using the controlled diffusion solidification technology coupled with the tilt pour gravity casting process. The effect of T4 and T6 heat treatment on the castings was investigated using seven alloy compositions with the total alloying content (Zn + Mg + Cu) varying from 4.6 to 10.6 wt%. The uniaxial tensile yield strengths (0.2% proof stress) of the respective alloys were measured for T4 temper and varied between 125 and 316 MPa and for the T6 temper samples varied between 280 and 540 MPa. A quantitative image analysis was carried out to measure the eutectic phase fraction, which was compared with predictions from thermodynamic solidification simulations. The experimental phase characterization of various secondary phases/precipitates was conducted using an electron microscopy (STEM) methodology along with energy dispersive spectroscopy (EDS) results; other experimental method such as the Archimedes’ density measurements was also used to evaluate porosity content in the samples. The motivation for this study was to investigate the effect of the solute redistribution of alloying elements during solidification process in the CDS casting;10, 11, 12 which is different from the solute rejection mechanism occurring in a conventional solidification process. The stoichiometry, size and distribution of the strengthening precipitates that form after the T4 solutionizing heat treatment, during the natural and artificial ageing processes, in the supersaturated solid solution (SSSS) Al matrix are the important parameters that control the YS of these alloys.9,13, 14, 15 In the present study, uniaxial tensile properties were evaluated for seven distinct compositions of the Al-7000 alloy series along with selective results from detailed quantitative metallography to show the critical features of the microstructure that affect the mechanical properties of these alloys. Some of the information presented here in this study is extracted from the doctoral dissertation of the first author, Ghiaasiaan.8 The elemental compositions of the alloys reported in this publication are all in percentage by weight, unless otherwise mentioned. 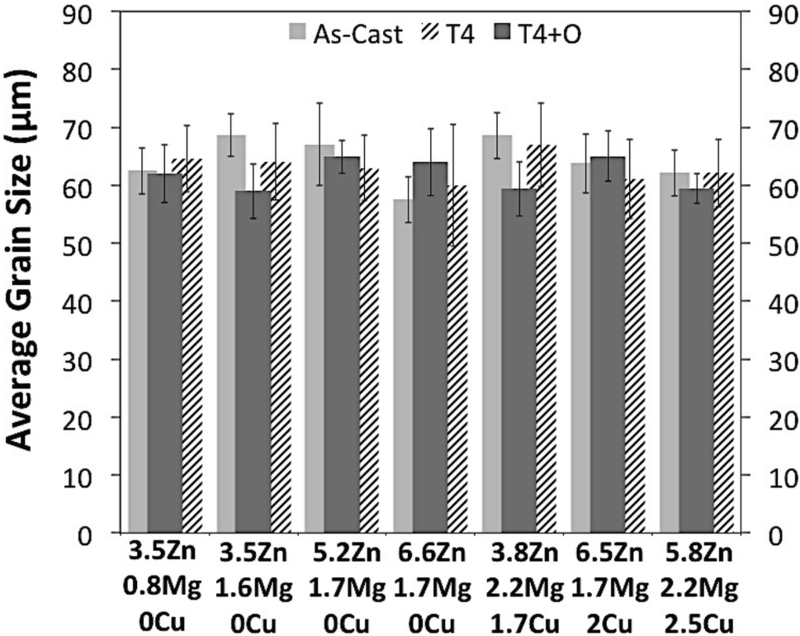 Seven distinct alloy compositions from the Al–Zn–Mg–(Cu) alloy family were selected for this study; the sum total of the alloying elements (Zn + Mg + Cu) ranging between 4.6 and 10.6 wt%. The actual compositions of these alloys are presented in Table 1. It is notable that the measurements were carried out using the glow discharge optical emission spectroscopy (GDOES) method, and the mean of ten data points for each alloy has been reported. In Table 1, alloy numbers 1–4 are referred to as Cu-Free alloys because no Cu was added deliberately and alloy numbers 5–7 are referred to as Cu-Bearing alloys. Table 2 presents the CDS process parameters: the measured liquidus temperature of each of the two precursor alloys (Alloy1 and Alloy2), the measured liquidus temperature of the final desired Alloy3 composition which was carried out by remelting a portion of the casting and re-solidifying at a constant rate of 1 K s−1, the melt pouring temperatures of the two precursor alloys, and the liquidus temperature of the final desired Alloy3 composition that was simulated using Pandat Software23 with the non-equilibrium Scheil–Gulliver solidification paradigm. The rationale for the selection of the two precursor alloys for the seven alloys in Table 1 has been presented in Ghiaasiaan.8 About 30 kg of each precursor alloy was freshly prepared in two separate electric furnaces. The furnaces were individually degassed using a rotary degasser at 120 RPM for 30 min using ultrahigh-purity argon gas purged into the molten alloy at a flow rate of about 6 L min−1. The Alloy2 was first poured into the pouring cup of the TPGC machine using a pre-designed pouring ladle to accommodate the required mass of Alloy2; this was immediately followed by pouring in the Alloy1 with another pre-designed pouring ladle to accommodate the appropriate required mass of this precursor alloy; this was immediately followed by activating the tilting mechanism of the TPGC machine to enable filling of the mould cavity. The mould cavity consisted of two cylindrical uniaxial tensile specimens akin to the ASTM standard B557 along with a fatigue test specimen.6, 7, 8, 9 The gross weight of each final casting part poured into mould was about 900 g.
Microstructural analyses were carried out on samples that were prepared from the gauge section of uniaxial tensile specimens; the samples were mounted, ground, polished and etched (using freshly made Keller’s reagent: 1 mL HF, 1.5 mL HCL, 2.5 mL HNO3 and H2O) for the purpose of optical light microscopy. The optical micrographs were obtained using a Stereograph Microscope (Nikon AZ 100M24) and light optical microscope (Nikon Eclipse LV100). For the scanning electron microscopy (SEM), the mounted samples were used in the as-polished condition without any further etching. The SEM analysis was carried out using a JEOL JSM-7000F electron microscope, equipped with energy-dispersive X-ray (EDX) analysing system. Further quantitative image analyses were carried out on the SEM and optical micrographs using the commercial ImageJ25 software in accordance with the ASTM standard E1245-03 (Reapproved 2008) and ASTM standard E112-1326 in order to measure the secondary particle and grain size, respectively. The grain size was measured using the linear interception method with a minimum number of 20 lines for each optical micrograph. For each alloy/heat treatment condition, at least 5 micrographs were used in low magnification of 200× for quantitative metallography. Thin-foil specimens for TEM studies were prepared by electropolishing and ion milling techniques using the GATAN PIPS ion mill. The electropolishing solution consisted of 10% perchloric acid in 20% glycerol and 70% methanol at 253 K (− 20 °C) using standard twin-jet polishing. TEM studies were performed on all heat-treated materials using a 200 keV electron beam and equipped with a high-angle annular dark-field (HAADF) STEM detector and super-X-ray detection technology. In order to study the chemistry of different phases, energy-dispersive spectroscopy (EDS) technique was used in STEM-HAADF mode to perform quantitative analysis and elemental mapping. The conventional bright-field and dark-field imaging and selected area diffraction (SAD) pattern were employed to study the microstructure and precipitation phases. 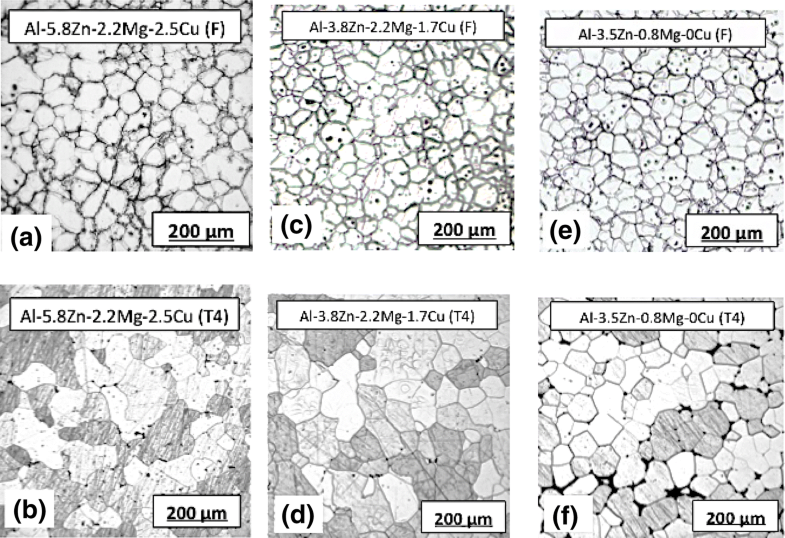 In the following section, the uniaxial tensile properties of the Al–Zn–Mg–Cu alloys manufactured using the CDS + TPGC process will be presented and discussed in conjunction with their microstructural evolution during the solution heat treatment (T4) process; further, critical microstructural parameters such as porosity content and grain size distributions were quantified. Figure 1 presents the average values for uniaxial tensile properties of the seven alloys from the Al 7000 alloy family. In Figure 1a, b, the uniaxial tensile properties, yield strength (YS), ultimate tensile strength (UTS) and elongation (EL) are presented for the CDS cast alloys using the typical comparative bar graphs in both T4 and T6 tempers, respectively. Typical comparative bar graphs of uniaxial tensile properties for the seven Al-7000 alloys in the (a) solution heat-treated (T4) and (b) near peak age (T6) tempers. As in Figure 1a, b, the strength of the materials in both the T4 and T6 conditions increased with the increase of total alloying elements for these single phase solidifying alloys because of the increase in the degree of supersaturation of the primary Al solid solution (SSSS) after the T4 heat treatment30 and increase in the size and volume fraction of the strengthening precipitate phases forming during the natural ageing at ambient conditions and artificial ageing in T6 heat treatment.8 However, increasing the total alloying elements leads to decreasing ductility (uniaxial elongation) in both the T4 and T6 tempers, alike, as shown in Figure 1a, b, respectively. This could be attributed to the increase in the volume fraction of the metastable and stable secondary and intermetallic phases in addition to adding new variations of the same, arising from the increase in the total alloying elements in the castings: for example, the iron/silicon bearing phases, S phase, T phase, Mg2Si, etc. Since the levels of Zn, Mg and Cu in these alloys are less than their respective maximum solubility limits in the primary solid solution of Al, the increase in each alloying element will increase the total amount of alloying element content in the supersaturated solid solution (SSSS) of the Al matrix at the end of T4 treatment, which in turn results in an increase in the yield strength of Al–Zn–Mg–Cu alloys due to a larger resistance offered to the dislocation movement under tensile load.31, 32, 33, 34 Further, the higher level of alloying elements increases the driving force that is required for the evolution of strengthening precipitates during subsequent ageing processes such as natural (ambient temperature) and/or artificial (high-temperature) ageing of these alloys.34, 35, 36, 37, 38 Figure 2a presents the plots of YS as a function of total alloying element content in the respective alloys, in both T4 and T6 temper conditions. Similarly, Figure 2b presents a similar plot for the uniaxial elongation in these alloys in T4 temper condition. It is noteworthy that in Figure 2, the elongation values for the T6 temper conditions were not presented as it did not provide any notable trends due to the low values of the same, as can be seen in Figure 1b. In Figure 2b, the empirical regression lines of elongation in Cu-Free alloys has significantly higher (nearly double) elongation values when compared to the Cu-Bearing alloys with the same total alloying element content in each. The addition of Cu to these alloys leads to three uniquely distinctive effects on the microstructure of the cast and heat-treated alloy castings. 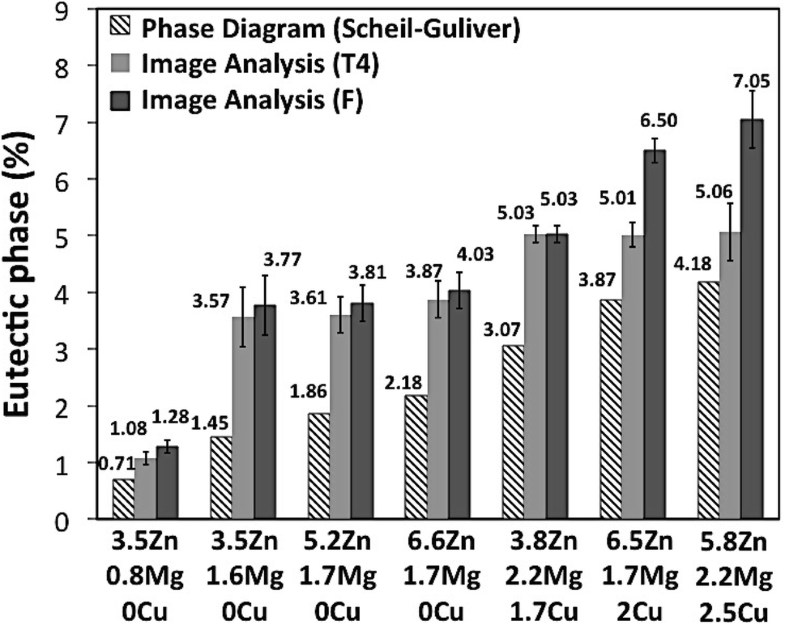 The first is the evolution of both the θ-Al2Cu and S-Al2CuMg phases during the solidification of the Cu-Bearing alloys; both of these are secondary intermetallic phases which are detrimental to the mechanical properties. During the T4 solutionizing heat treatment, most of the θ-Al2Cu phase will transform to the S-Al2CuMg in the microstructure;8 typical microstructures of these phases in F and T4 tempers are shown in Figure 3. 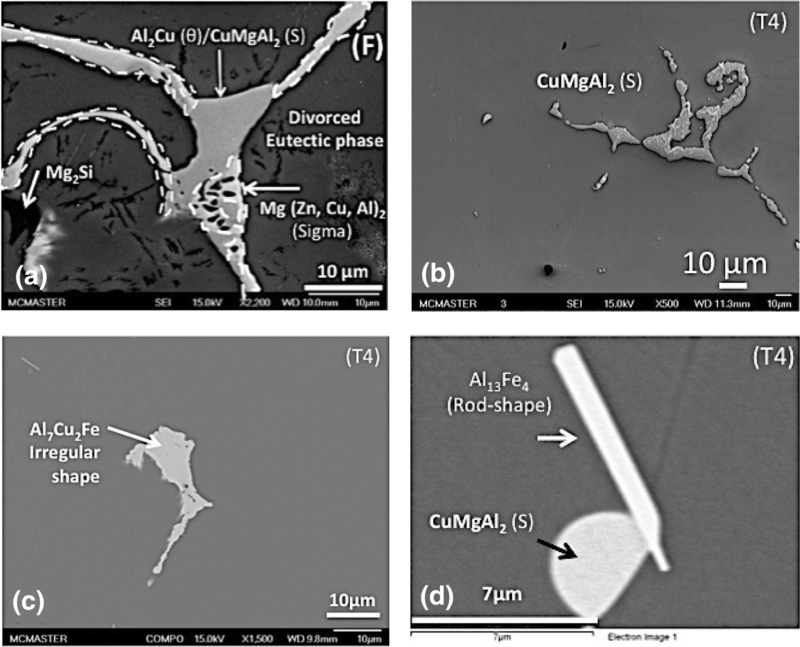 The second effect of Cu addition would be the evolution of the Al7Cu2Fe intermetallic phases during the T4 solutionized microstructure; these phases have a bulky irregular morphology and may have evolved from the transformation of the metastable Al6Fe/AlmFe phases that are present in the F temper sample microstructure; typical image of the Al7Cu2Fe phase in the T4 condition is shown in Figure 3c. It is notable that the metastable Al6Fe/AlmFe phases could also transform to the plate-like/rod-like Al13Fe4 phase in the absence of sufficient Cu atoms in the microstructure vicinity as shown in Figure 3d. The third effect of Cu addition is the reduction in the size of the strengthening precipitates coupled with an increase in the volume fraction of the same in the primary Al matrix;8 this is shown by typical TEM images in Figure 4 for alloy numbers 1, 5 and 7 that contain three levels of Cu in them. All the three above-mentioned effects of the Cu addition to these alloys will have a detrimental effect on the elongation (plastic deformation) as illustrated by Figure 2b. Effect of total alloying element on the uniaxial tensile properties of the CDS cast Al 7000 alloys: (a) yield strengths in both the T4 and T6 temper conditions; and (b) the elongation in T4 temper. Typical TEM micrographs in bright-field and dark-field modes, respectively, for the CDS castings in near peak age (T6) condition. (a, b) the Al-3.5Zn–0.8Mg–0Cu alloy; (c, d) the Al3.8Zn–2.2Mg–1.7Cu alloy; and (e, f) the Al–5.8Zn–2.2Mg–2.5Cu alloy. Figure 6 presents the phase fraction for the eutectic (secondary and intermetallic) phases forming at grain boundaries measured using a 2D image analysis for the seven alloys in this study. The eutectic phases form during the final stage of solidification in the inter-dendritic and gain boundary areas from an enriched melt with a composition close to the eutectic alloy.34 It is notable in Figure 6 that the experimental measurements for the eutectic phase fractions in two different tempers (as-cast and T4) are compared with the values that predicted by phase diagram using Pandat software under a non-equilibrium solidification (Scheil–Gulliver) condition. Figure 7 presents the variation of the fraction solid (primary Al and secondary phases) in all the seven experimental alloys as predicted by the simulations using Scheil–Gulliver non-equilibrium paradigm for solidification. As it can be seen in Figure 6, the experimentally evaluated total volume fraction of the secondary phases in both the F and T4 tempers is larger than that predicted by simulations; the observed deviation between simulations and experimental measurements is higher for F temper than for the T4 temper condition. The initial pre-nucleation of the primary Al phase during the mixing stage of the two precursor alloys in the CDS technology would render the resultant solidifying liquid with a significantly higher solute content, and hence, the experiments would yield a higher volume fraction of the secondary phases at the end of the evolution of the primary Al phase; however, the simulation considers full dissolution of the solute in the liquid ahead of the growing solidifying interface (Scheil–Gulliver paradigm) in addition to assuming an alloy with lesser solute content initially (shown in Table 1) than in the experiments, leading to a reduction in the predicted volume fraction of the secondary phases. Further, the S, sigma and θ-Al2Cu phases are non-equilibrium phases that do not appear in the solidification simulations; hence, these phases would disassociate and dissolve into the primary Al matrix to form supersaturated solid solution (SSSS) at the end of a significantly extended solutionizing heat treatment (T4). However, some of the elements such as Cu and Mg may react with the impurity Fe and Si elements in the alloy to evolve as Cu2FeAl7 and Mg2Si phases, hence leading to a significant reduction in the volume fraction of the secondary eutectic phases in these alloys after the solutionizing (T4) treatment, as shown in Figure 6. Further, the increase in total alloying elements in these alloys will show an increase in the Fe-based intermetallic phases (especially after T4 treatment) which would result in a lower elongation, as shown in Figure 2b. Typical comparative bar graphs for the phase fractions (%) of the eutectic phases in the seven Al 7000 alloys in this study forming at grain boundary (GB) areas. Three types of data values are compared: 2D image analysis using the SEM images for the as-cast (F) and T4 temper samples and that obtained from phase diagram simulation using non-equilibrium solidification condition (Scheil–Gulliver paradigm). Non-equilibrium (Scheil–Gulliver) solidification simulations showing variation of solid fraction with temperature for the seven alloys in this study; showing the accumulatively increasing amount of eutectic phases at grain boundary areas with total alloying elements. The other microstructural factors that could potentially have an effect on the uniaxial tensile properties of these alloys are porosity and grain morphology. Figure 8 presents the typical comparative bar charts for the porosity content of all the seven alloys; the Cu-Bearing alloys showed a slight, albeit notable increase in the porosity when compared to the Cu-Free alloys. Porosity in these castings could be from either solidification shrinkage or dissolved hydrogen gas. It may be safe to assume that the dissolved hydrogen in the initial alloy melts would be nearly constant due to the efforts of degassing the melt with ultrahigh-purity Ar gas, prior to casting. 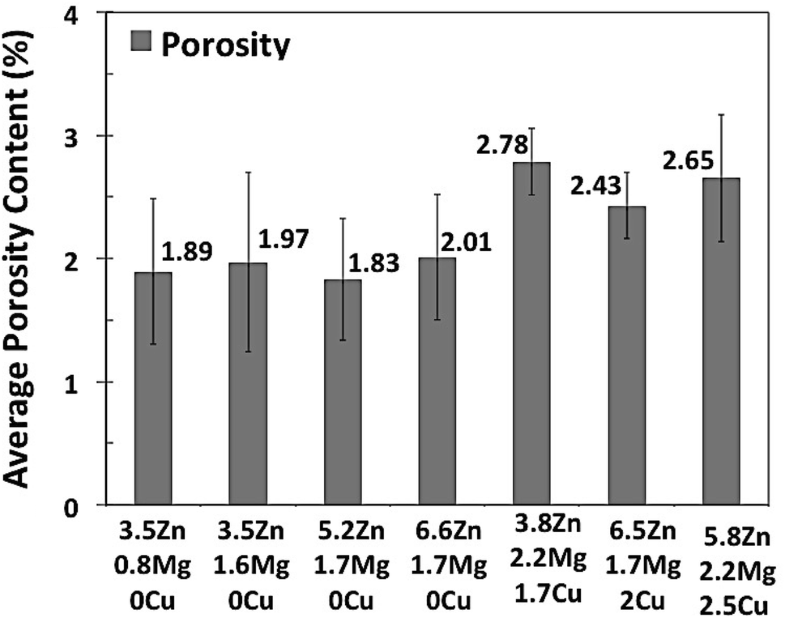 Hence, the variation of the results of the density measurements, shown in Figure 9, could be attributed to be mostly from the shrinkage porosity in the castings. Addition of Cu to these alloys seems to increase shrinkage porosity. The porosity content of the seven CDS cast Al-7000 alloys selected for this study. The comparative bar graphs representation of the average grain sizes of the CDS cast Al-7000 alloys. 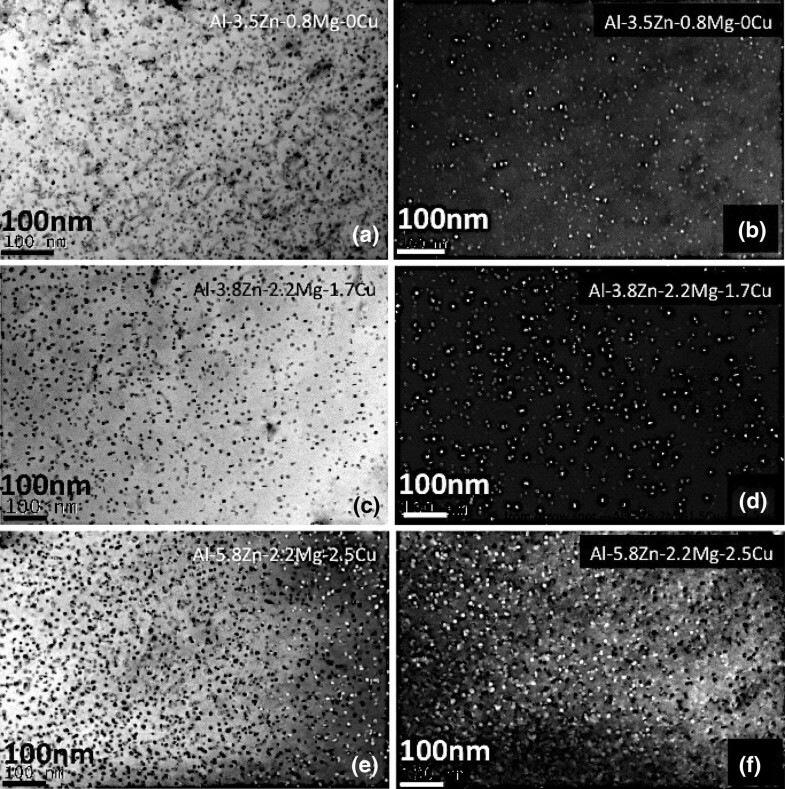 Figure 10 presents the typical non-dendritic morphology of the primary Al grains in alloy numbers 1, 5 and 7, to represent low, medium and high total alloy content, as shown in Figure 1; all the seven alloys show similar non-dendritic primary phase morphology, which would be one of the principle reasons that enables manufacturing of sound castings from these alloys. Typical optical micrographs used for grain size measurements of the CDS castings in two different heat treatments: as-cast (F) and T4, respectively, for the (a, b) Al–5.8Zn–2.2Mg–2.5Cu alloy, (c, d) Al–3.8Zn–2.2Mg–1.7Cu and (e, f) Al-3.5Zn–0.8Mg–0Cu alloys. Further, experimental measurements of the 2.65 vol% porosity for the CDS cast components of the Al–5.8Zn–2.2Mg–2.5Cu (7050) alloy and 2.82 vol% porosity for the wrought (hot-rolled thick plate) samples of the same composition that was provided by a supplier are in the same regime of acceptable sound products; notably reported porosity content44 for the direct chill (DC) cast ingots of the Al-7050 alloy used for the wrought products is about 2.4 vol%. 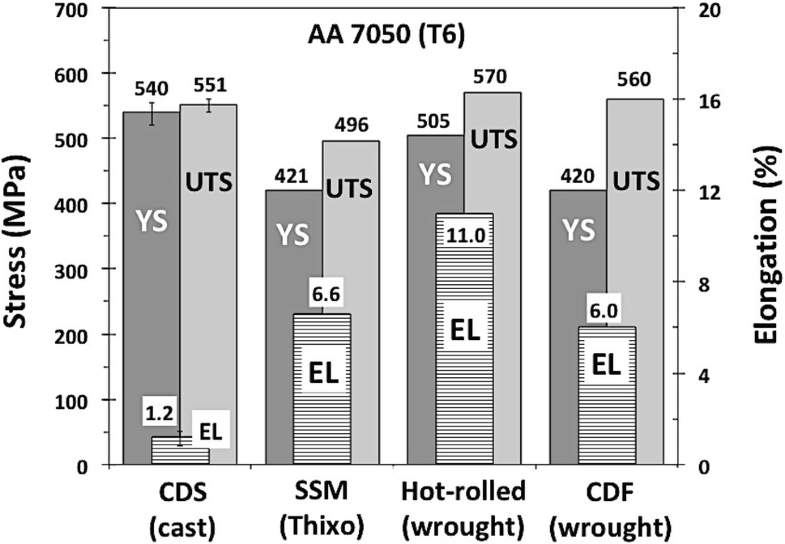 Figure 11 presents a comparison of the uniaxial tensile properties of the AA 7050 alloy in T6 temper for castings and products made by CDS casting technology, semisolid metal (SSM) casting, thixoforming and closed die forging (CDF).45, 46, 47, 48 It is notable in Figure 11 that the uniaxial tensile properties of the CDS cast components of AA 7050 alloy in T6 temper conditions are fairly consistent with that of other wrought counterparts.49, 50, 51, 52, 53 However, the elongation (or ductility) response of the CDS cast material under uniaxial tensile test is noticeably lower as compared with that of the other wrought components. The lower ductility in the CDS cast Al-7050 alloy could be attributed to the observed difference in the size and morphology of detrimental secondary and intermetallic impurity (Fe) phases found in the CDS castings as compared with that of wrought products. During the solid-state thermomechanical processes involved in the wrought products, the coarse secondary and intermetallic phases such as S-/Fe-phases are broken into a finer sizes and morphologies that are less detrimental to the elongation; most of which are more likely aligned with the working direction or metal flow.3 Further, the yield strength of the CDS casting of AA7050 alloy increased from 360 MPa in the T4 condition to 540 MPa in the T6 condition, while the elongation dropped from 7.3 to 1.2% between these two temper conditions; this may suggest that an over-ageing treatment would enable the YS and elongation to be comparable to both the SSM (Thixo) and CDF (wrought) product values as shown in Figure 11. 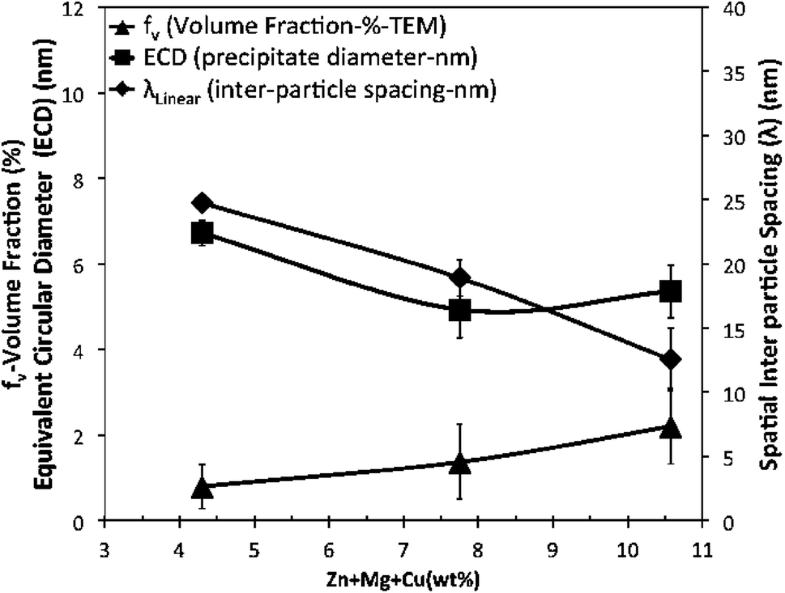 Comparative bar graphs for uniaxial tensile properties of the Al–6Zn–2Mg–2Cu alloy in T6 tempers that were produced using various methods such as the CDS process (this study) and other wrought processes (found in literature background). Seven compositions of the alloy that fall within the family of Al–Zn–Mg–Cu (Al 7000) alloys were prepared and successfully cast into sound net-shaped components using the CDS technology coupled with the TPGC process. The compositions reflect the conditions of lowest to highest acceptable limits of each of Zn, Mg and Cu in the alloy to demonstrate the feasibility of using the CDS technology to repeatedly cast nearly defect-free components of this alloy family, with a non-dendritic morphology of the primary Al phase. 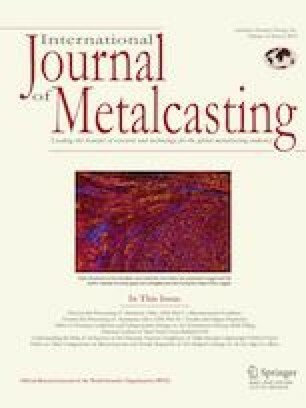 The experimental results for the CDS cast components showed that the nature of secondary and intermetallic phases and strengthening precipitates evolving either during solidification or subsequent heat treatments for these alloys is consistent with the background literature reported for the wrought-processed counterparts. The results of the quantitative metallography showed that there is an increase in the total amount of the secondary phases evolving during solidification from that predicted by the thermodynamic solidification simulations and such increase in the volume fraction is higher for the alloys with higher total alloying elements (Zn + Mg + Cu) in them; further, when the castings were heat-treated to the T4 temper condition, several of these secondary phases that evolved during solidification under metastable non-equilibrium conditions disassociated and dissolved back as solid solution into the Al matrix, which rendered the volume fraction of such secondary phases back to a values closer to those predicted by the thermodynamic simulations. The ability to manufacture high-quality and sound net-shaped castings of Al 7000 alloys using the CDS technology coupled with tilt pour gravity casting process has been validated and the mechanical properties after appropriate heat treatments provide a high specific strength in these castings, values which are comparable to those of the wrought product counterparts of these alloys. There is a reduction in the elongation of the cast samples are various heat treatment, which may be attributed to problems associated with cleanliness of alloy melt during the mixing of the two precursor alloys (not optimized) and the inherent defects of net-shaped casting. The author expresses his gratitude to the Natural Sciences and Engineering Research Council (NSERC) of Canada for their financial support through the Discovery Grant programme. Pandat thermodynamic simulation software with PanAl2014 database; Computherm LLC. http://www.computherm.com/. Accessed Dec 2014. ASTM B328-96(2003)e1, Standard Test Method for Density, Oil Content, and Interconnected Porosity of Sintered Metal Structural Parts and Oil-Impregnated Bearings (Withdrawn 2009). (ASTM International, West Conshohocken, 2003). https://doi.org/10.1520/b0328-96r03e01. www.astm.org. Accessed Dec 2014. Mill Certificate, Al 7050 Product data sheet (ALCOA worldwide, 2013). http://www.alcoa.com. Accessed Dec 2014.